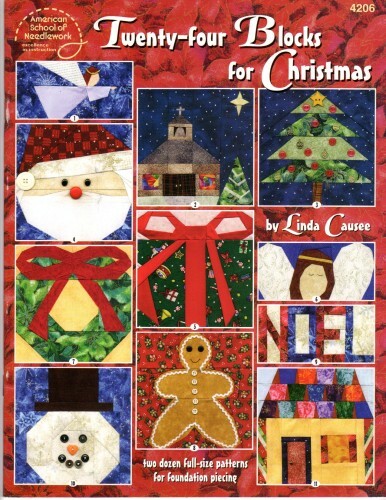 American School of Needlework Twenty-Four Blocks for Christmas quilting pattern booklet. Linda Causee. Celestial Angel, Village Chapel, Oh Tannenbaum, Gift Wrapped, Jolly Old St Nick, Holly Wreath, Joyful Angel, The First Noel, Gingerbread Treat, Smiling Snowman, Gingerbread House, Sugarplum Stocking, Pretty Poinsettia, Blitzen, Light the Way, Cheerful Bow, Silverbell, Icicle Ornament, Candy Cane Lane, Village Square, Starbright, Christmas Bulb, Holiday Bauble, Frosty. 32 page instructional booklet. Out of print.